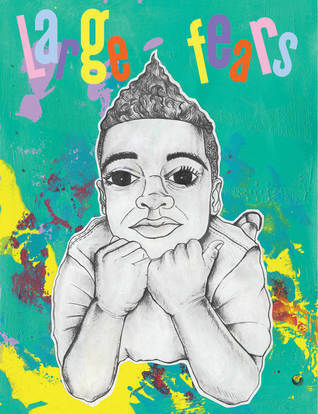 Queer-affirming children’s book Large Fears (2015) is the product of a collaboration between writer Myles E. Johnson and illustrator Kendrick Daye. Each two page-spread is a vignette combining prose-poetry, photographs, black and white sketches, and color blasts that provide readers with access to the witty, whimsical, controlled chaos of young Jeremiah’s mind. Jeremiah is a queer black boy who loves pink and wants to go to Mars but his fears are almost as big as his dreams and they keep him Earth-bound. However, his desire eventually gives him strength and he gains the confidence to plunge into the unknown. This magnificent tale reminds me a bit of The Little Prince and a bit of Alice in Wonderland, but it is really quite unique; a meditation aimed at generating self-confidence that unfolds gorgeously. I thoroughly enjoyed this book and recommend it for personal and classroom libraries. Since it is quite text heavy, it is most appropriate for audiences five-years and older. Like many of the queerest kid lit currently available, this was self-published with the help of a Kickstarter campaign.